Making Marketo work for you. You found the answer to your marketing strategy in the most powerful marketing automation platform on the market, but it’s left you with more question marks. To make the most of Marketo, you need the right talent, the right strategy, the right content, the right data – it’s a lot. What you really need is the right partner. 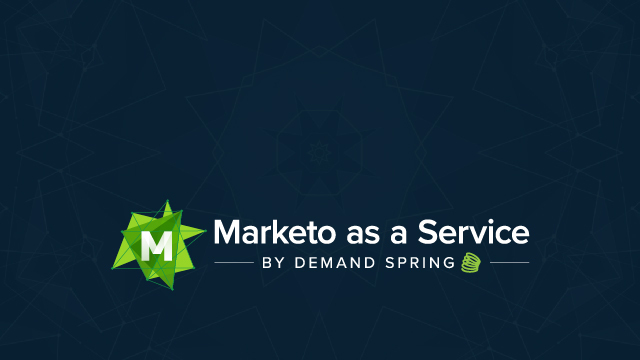 Marketo as a Service, at your service. Hint: We know you’re busy (obviously). Use this as a tool to build your case. Leave it all to the pros. Or some of it. You choose. Setting your campaign up for success with Marketo best practices. Driving engagement with the right messages for your audience. Creating full-funnel campaigns that inspire, educate, nurture, and convert. Ensuring sound processes and practices are in place, followed, and managed. the more you get out of it. The cost of MaaS is equivalent to about 75% of hiring internally. Get “always on” best practices and save money. Save time with higher quality leads through increased and improved engagement. Turn prospects into customers and customers into advocates. Provide sales and marketing the insight and power to focus on what they do best and succeed. Find relief from manual processes and put your struggles with Marketo behind you. Feel confident that your marketing automation needs are in the right hands. Enjoy sweeter dreams knowing that you’re getting the full value of your Marketo investment. letting the leads roll in. Quality marketing automation with Marketo takes work – hard work that we’re not only willing to do, but also certified to do. A solution for every size. Ideal for start-ups & small businesses. Demand Spring has been critical in helping us drive engagement with our prospects and clients. Not only did they elevate our use of Marketo—providing us with flawless campaign execution, rigorous A/B testing, insight into campaign performance, and email copy advisory— they also identified and implemented improvements in the core functionality of the platform. All our packages start with Marketo Campaign Execution as a base. Our team will run your email, event, engagement, and default programs. Clients can then choose to add any or all three components: Content Development, Campaign Strategy, and Data Governance. Why should I consider MaaS? Three reasons: 1) Finding and keeping skilled Marketo talent is difficult, 2) We apply best practices in campaign and content strategy and implementation, and 3) Our pricing is also more cost-effective than hiring an in-house employee. So you get always-on talent with proven strategies to maximize results at a lower price. MaaS pricing is up to 75% of the cost of hiring internally. Download our MaaS story for more convincing. How long is a MaaS contract? MaaS is an annual program, providing you the Marketo Campaign Execution services you need for a full twelve months. How does the pricing work for MaaS? MaaS is priced by the number of campaigns you run per month, ranging from 10 to 200. We offer four packages. A single email is considered a campaign, as is an event such as a webinar. Does MaaS include Marketo implementation? Need help setting up Marketo first? 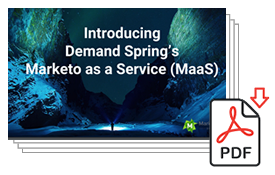 While it’s not part of the offerings from MaaS, Demand Spring also has a team of Marketo Certified Experts that can help you fully implement or optimize your Marketo instance. Whether you’re new to marketing automation or migrating from another MAP platform, you’ll be covered. Using MaaS Implementation Methodology, we’ll take care of all the configuration and integration details, and launch of all of Marketo’s capabilities. You’ve implemented Marketo but not really. It’s only being used today as an email platform. Demand Spring will make sure you’re fully up and running on capabilities such as lead scoring, lead nurturing, lead lifecycle, and Marketo’s analytics engine.